Please do not reproduce this map on any other webpage. Thank you. After these things - This is a time phrase and should always provoke the question "What time?" or in this case "After what things?" While this genre of question is not "rocket science," it will force you to review the context and thus helps solidify the passages in your mind (never a bad thing!) Here the time is after Paul's ministry in Athens, including his message (Acts 17:16-30) and the response in Athens (Acts 17:31-34). And just to convince you how important observation of time phrases can be this same phrase, after these things, occurs some 19 times in the NT, and most are in the Revelation of Jesus Christ (Rev. 1:19; Rev. 4:1; Rev. 7:9; Rev. 9:12; Rev. 15:5; Rev. 18:1; Rev. 19:1; Rev. 20:3) where this phrase serves as an important "key" which helps unlock John's great prophecy of the end-times (assuming you approach the text literally). KJV Acts 18:2 And found a certain Jew named Aquila, born in Pontus, lately come from Italy, with his wife Priscilla; (because that Claudius had commanded all Jews to depart from Rome:) and came unto them. And he found a Jew named Aquila (eagle Ac18:2,18, 26 Ro 16:3 1Co 16:19 2Ti 4:19) a native of Pontus having recently come from Italy with his wife Priscilla (ancient): We do not know if Aquila and Priscilla were Christians when Paul first met them, but it seems likely that they were since Luke did not mention their conversion (as he does often in Acts). But it is possible that Paul led them both to Jesus as they worked together as tentmakers (those who worked with leather). Pontus (map, another map) was the Roman province in Asia Minor that lay east of Bithynia on the Black Sea coast (in modern northern Turkey). Priscilla had another name, Prisca (Ro 16:3; 1Co 16:19; 2Ti 4:19),the latter being more formal. Her name frequently appears before her husband Aquila's in the New Testament (e.g., Acts 18:18-19, 26; Ro16:3; 2Ti4:19). This may indicate that she came from a higher social class than Aquila or that others regarded her as superior to him in some respect. Here, however, Luke mentioned Aquila first. Luke normally used the colloquial, diminutive form of names (e.g., Silas, Sopatros, Priscilla, Apollos), but Paul preferred their formal names in his writings (e.g., Silvanus, Sosipatros, Prisca, Epaphroditus). Nevertheless he sometimes used the more popular form of a name (e.g., Apollos, Epaphras). because Claudius had commanded all the Jews to leave Rome. When Paul met Aquila and his wife Priscilla, presumably they were already Christians. They had recently come from Italy because Claudius (the 5th Roman Emperor between 41-54 reigning 13 years as a weak minded man who & laughing stock of the court) had commanded all the Jews to depart from Rome. This formal outbreak of anti-Semitism occurred in about AD49, (other expulsions of Jews from Rome occurred in 139BC & 19AD)when there were approximately 20,000 Jews in Rome. They were unpopular; Tiberius had exiled 4,000 from Rome to Sardinia. Fifty or more years later the Roman historian Suetonius (was born in AD69 & so wrote considerably after the event) maintained that Claudius's decree against the Jews came because the "Jews were in a state of constant tumult at the instigation of one `Christus.'" The Jews probably pronounced the name "Christ" approximately this way. Roman authorities viewed the spread of Judaism as a threat to Rome. Jewish businessmen aroused the resentment of their non-Jewish competitors. Jews were scorned for refusing to burn incense before the emperor's statue -- worse than Americans refusing to salute their flag. Jews, including the followers of Jesus, aroused suspicion by their inclination to keep to themselves. Persecution of followers of Jesus came with a great fire in Rome in the year 64, a fire that raged for many days, that almost destroyed the entire city and was horrendous enough to seem like Armageddon had arrived. Perhaps some Christians in Rome saw the fire as the beginning of the fulfillment of their expectations that the world would be destroyed by fire. Reports of joyous dancing, looks of glee and shouts of hallelujahs would have attracted suspicion, and Christians were an easy target because they were still thought of as Jews. An official investigation concluded that the fire had been started by Jewish fanatics. This put the Jewish community in Rome in danger, and Jewish leaders in Rome may have tried to avert this danger by describing to authorities the difference between themselves and the Christians. The leaders of Jews in Rome could reach the emperor, Nero, through his new wife, Sabina Poppaea. Nero learned of the separate identity of those Jews who were followers of Jesus, and he put blame on them for the fire. Nero had some Christians executed in the usual way of executing criminals: putting them in the arena against gladiators or wild animals, or as was commonly done to those convicted of arson, having them burned to death. It was around this time that the apostles Peter and Paul vanished. According to the historian Tacitus, who wrote decades later, many Romans remained suspicious of Nero. Many believed the rumor that Nero had started the fire to make space for his new great mansion, and they pitied the Christians, believing that instead of being sacrificed for the welfare of the state, the Christians were being sacrificed as Nero's scapegoats. Acts 18:3 and because he was of the same trade, he stayed with them and they were working, for by trade they were tent-makers. KJV Acts 18:3 And because he was of the same craft, he abode with them, and wrought: for by their occupation they were tentmakers. Acts 18:4 And he was reasoning in the synagogue every Sabbath and trying to persuade Jews and Greeks. KJV Acts 18:4 And he reasoned in the synagogue every sabbath, and persuaded the Jews and the Greeks. KJV Acts 18:5 And when Silas and Timotheus were come from Macedonia, Paul was pressed in the spirit, and testified to the Jews that Jesus was Christ. Acts 18:6 But when they resisted and blasphemed, he shook out his garments and said to them, "Your blood be on your own heads! I am clean. From now on I will go to the Gentiles. KJV Acts 18:7 And he departed thence, and entered into a certain man's house, named Justus, one that worshipped God, whose house joined hard to the synagogue. KJV Acts 18:8 And Crispus, the chief ruler of the synagogue, believed on the Lord with all his house; and many of the Cor hearing believed, and were baptized. Acts 18:10 for I am with you, and no man will attack you in order to harm you, for I have many people in this city. KJV Acts 18:10 For I am with thee, and no man shall set on thee to hurt thee: for I have much people in this city. KJV Acts 18:11 And he continued there a year and six months, teaching the word of God among them. Cir A.M. 4059. A.D. 55. Acts 18:13 saying, "This man persuades men to worship God contrary to the law. KJV Acts 18:13 Saying, This fellow persuadeth men to worship God contrary to the law. Acts 18:15 but if there are questions about words and names and your own law, look after it yourselves; I am unwilling to be a judge of these matters. KJV Acts 18:15 But if it be a question of words and names, and of your law, look ye to it; for I will be no judge of such matters. KJV Acts 18:16 And he drave them from the judgment seat. KJV Acts 18:17 Then all the Greeks took Sosthenes, the chief ruler of the synagogue, and beat him before the judgment seat. And Gallio cared for none of those things. KJV Acts 18:18 And Paul after this tarried there yet a good while, and then took his leave of the brethren, and sailed thence into Syria, and with him Priscilla and Aquila; having shorn his head in Cenchrea: for he had a vow. Acts 18:19 They came to Ephesus, and he left them there. Now he himself entered the synagogue and reasoned with the Jews. KJV Acts 18:19 And he came to Ephesus, and left them there: but he himself entered into the synagogue, and reasoned with the Jews. Acts 18:21 but taking leave of them and saying, "I will return to you again if God wills," he set sail from Ephesus. KJV Acts 18:21 But bade them farewell, saying, I must by all means keep this feast that cometh in Jerusalem: but I will return again unto you, if God will. And he sailed from Ephesus. 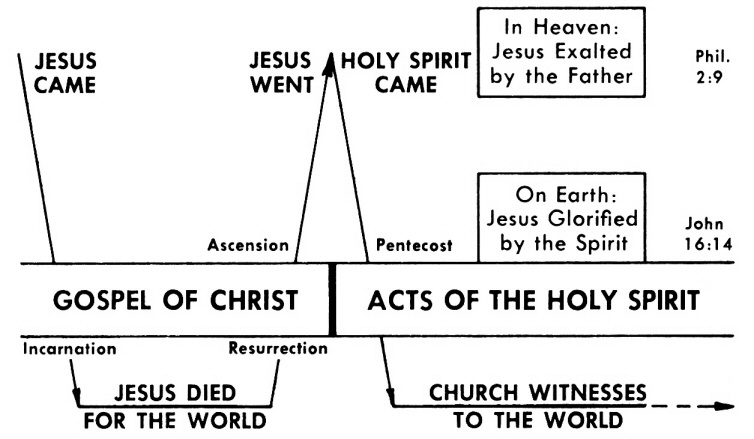 Acts 18:22 When he had landed at Caesarea, he went up and greeted the church, and went down to Antioch. KJV Acts 18:22 And when he had landed at Caesarea, and gone up, and saluted the church, he went down to Antioch. Acts 18:23 And having spent some time there, he left and passed successively through the Galatian region and Phrygia, strengthening all the disciples. KJV Acts 18:23 And after he had spent some time there, he departed, and went over all the country of Galatia and Phrygia in order, strengthening all the disciples. 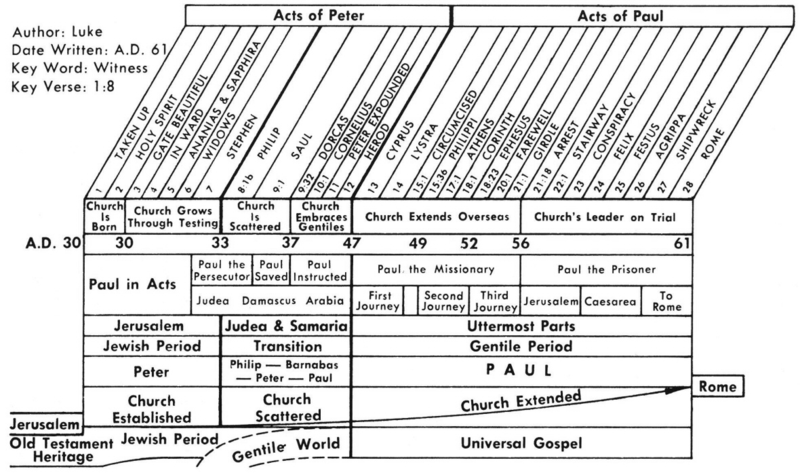 Missionary journeys are summarized below Click for the maps of each journey. Acts 18:24 Now a Jew named Apollos, an Alexandrian by birth, an eloquent man, came to Ephesus; and he was mighty in the Scriptures. KJV Acts 18:25 This man was instructed in the way of the Lord; and being fervent in the spirit, he spake and taught diligently the things of the Lord, knowing only the baptism of John. KJV Acts 18:26 And he began to speak boldly in the synagogue: whom when Aquila and Priscilla had heard, they took him unto them, and expounded unto him the way of God more perfectly. Acts 18:28 28 for he powerfully refuted the Jews in public, demonstrating by the Scriptures that Jesus was the Christ. KJV Acts 18:28 For he mightily convinced the Jews, and that publickly, shewing by the scriptures that Jesus was Christ.